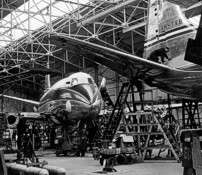 Below are the 9 photos we have on file for Viscount c/n 46 together with either the actual date that the photo was taken or an estimate of that date based on clues such as the livery worn or other background information. Delivered new to Trans-Australia Airlines (TAA) named as 'John Oxley'. 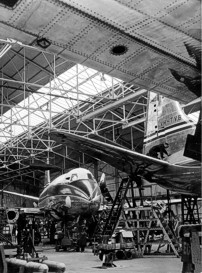 Taken at Hurn Airport, Bournemouth, Hampshire, England circa August 1954 on the production line with VH-TVB (C/N 45) in the foreground. Delivered new to Trans-Australia Airlines (TAA) named as 'John Oxley'. Taken at Wisley Airfield, Surrey, England 8 December 1954 shortly before it departed on delivery. Delivered new to Trans-Australia Airlines (TAA) named as 'John Oxley'. Taken over Western Port Bay, Victoria, Australia circa January 1955. Delivered new to Trans-Australia Airlines (TAA) named as 'John Oxley'. Taken at an unknown location circa June 1955. Leased from Trans-Australia Airlines (TAA). Taken at an unknown location circa June 1960.